Help raise money for Nea with little or no effort when you shop at local stores or online! Select Nea Community Learning Center at smile.amazon.com. Make it even easier, once you've selected Nea, by following the instructions to install Amazon Assistant to ensure your purchases will support your favorite charity. That will always take you to smile.amazon.com when you click on any link in the assistant. Just sign up for an eScrip account, and maximize your eScrip earnings by registering your credit cards and shopping online through the eScrip shopping site -- it's all secure! Read below for more info. eScrip - Register your cards with eScrip and Nea can automatically get a percentage of your purchases from participating merchants. 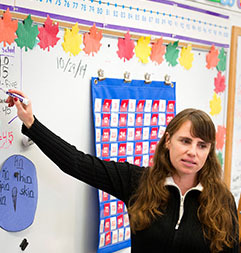 Teachers, family and friends can register too! Go to www.escrip.com for more information and to sign up. Make sure you select Nea (School ID #500023212 ) as the group you want to receive contributions. You can also choose to divide your contributions evenly between schools if you have more than one in your family! Earn while you shop online! -- BEFORE shopping online, make sure to FIRST visit the eScrip Online Store at http://shopping.escrip.com/. Click through from their merchant list to your favorite online store (including Amazon, JCrew, Apple and more!) and Nea will earn the percentage of the purchase listed. iGive -- Earn $$ for Nea When you Shop Online at Your Favorite Retailers! Sign up today and download the iGive Button. Whenever you shop online (Apple, Gap, Amazon.com and more) Nea gets a percentage of the sale. 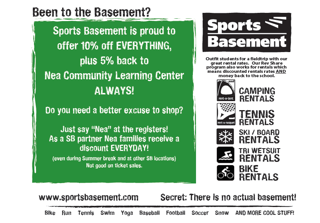 Sports Basement -- Just say "Nea" anytime you check out at Sports Basement. You'll save 10% and Nea will get 5% of your purchase!